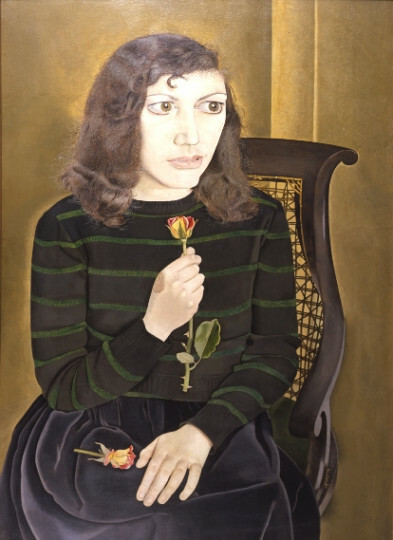 Kitty, the daughter of Jacob Epstein and Kathleen Garman, reappears in Lucian Freud’s portraits over the course of five years – clutching a kitten, head under leaves or on the pillow – but from the outset Girl with Roses establishes a scale and ambition that is life-size. She and Freud married in February 1948, and in the same year, Freud spent a whole train journey with Pablo Picasso’s Weeping Woman (1937),(1) taking it down to Brighton for an exhibition. Picasso wrenches the woman’s head apart, as if viewing her from inside out, through her own tears; Freud answers this visual outburst by observing how emo¬tion manifests itself on the outside. Newly pregnant, Kitty sits stiffly, her eyes averted in a dead stare. She clutches a rose, and another lies limp in her lap. A yellow-pink breed, renamed the ‘Peace Rose’ at the end of the war, it is more than the traditional love token and, like the glimmer of Kitty’s teeth, adds a hint of menace. Titian’s fleshy Venus of Urbino (1538)(2) is recast for a cold climate of woollies and rations. Girl with Roses is as much a love portrait of Freud’s painter heroes as of Kitty. It unfolds from the rose at its centre, a nod to the straight¬forward flower paintings of Cedric Morris, under whom Freud studied at the East Anglian School of Painting and Drawing (1939–42). Petals rebound in the pale twist of Kitty’s lips, the bloom of her skirt, and finally the ochre folds in the background, which call to mind Jean Dominique Ingres. Freud admits, ‘You get really excited about an Ingres fold in a curtain because you don’t think that so much can be said in such an incisive and economical way.’(5) Indeed, the ‘Ingres of existentialism’ (Herbert Read’s tag) invokes the great dress of Madame Moitessier (1856)(6) with Kitty’s sweater. Its ribbed neck and cuffs and gently contoured stripes (black stippling was a tip from advertising, to make the green buzz) are defined incisively and economically – an understanding of fabric perhaps aided by a commission to create designs for dress fabrics for Asher (London) Ltd in 1946. In a statement published in Encounter to coincide with his selection for the XXVII Venice Biennale (1954), Freud explains, ‘The effect in space of two different human individuals can be as different as the effect of a candle and an electric light bulb. Therefore the painter must be concerned with the air surrounding his subject as with the subject itself.’(7) So, Kitty is viewed in prickly proximity, a halo of individual hairs reach out from her head, nervy with static. 3. Lawrence Gowing, Lucian Freud (London: Thames & Hudson, 1982), 81. 4. William Feaver, ‘Beyond Feeling’, Freud in conversation with Feaver, in Lucian Freud, exh. cat. (Sydney: Art Gallery of New South Wales, 1992), 12. 5. Freud quoted in William Feaver, Lucian Freud (New York: Rizzoli, 2007), 321. 6. The National Gallery, London. 7. Lucian Freud, ‘Some thoughts on painting’, Encounter, 3/1 (July 1954), 23–24.